Wuest: Clothe yourselves with the full armor of God to the end that you will be able to hold your ground against the strategems of the devil, . Put on (also used in Eph 6:14) (1746) (enduo) from en = in + dúo = to sink, go in or under, to put on) means literally to clothe or dress someone and to put on as a garment, to cause to get into a garment (eg, Lk 15:22 where the father says "quickly bring out the best robe and put it on him..."). The aorist imperative is a command to do put on the armor now. Don't delay. There is a sense of urgency in the aorist imperative. Just do it like the Nike commercial says. The middle voice conveys the idea that it is your choice to do it. You put on yourself this armor. You make the choice to initiate the putting on of God's armor and then you participate in the benefits of having it on. Not one is going to put it on you. God is not going to force you to put it on. His command and His good and acceptable and perfect will is for you to put it on, but it still comes down to a choice you must make. It has to do with surrendering your will to His will. Saying no to self (self sufficiency, self confidence, etc) and saying yes to God, obeying Him out of love, as a son or daughter would their Abba, their Daddy. Note also that this garment is unusual because it has to be put on from the inside! Ultimately this "new self" is Christ Himself (Ro 13:14) Legalism is putting them on the outside. You may look good in the pew or the pulpit but you won't be able to stand firm in the moment of temptation! Knowing the truth is not enough. You have to eat it, digest it, be renewed in your mind by it so that your futile thinking is taught, reproved, corrected and trained in the direction of righteousness then you are transformed from inside out by the Spirit. The basic necessity for the believer is to depend on the Lord and put on the armor—and leave it on. We are gullible and vulnerable if we think that merely knowing the facts in Ephesians 6:10-18 will protect us. The armor is an absolute requirement for daily victorious living. And even the battles seem to wane, we cannot become apathetic or forget that we are in spiritual warfare everyday for the rest of our life until the day we die! In the Gospels, enduo is used primarily in a literal sense e.g. Matthew 6:25 "For this reason I say to you, do not be anxious for your life, as to what you shall eat, or what you shall drink; nor for your body, as to what you shall put on. Is not life more than food, and the body than clothing? Matthew 27:31 And after they had mocked Him, they took His robe off and put His garments on Him, and led Him away to crucify Him. Mark 1:6 And John was clothed with camel's hair and wore a leather belt around his waist, and his diet was locusts and wild honey. Mark 6:9 but to wear sandals; and He added, "Do not put on two tunics." Mark 15:17 And they dressed Him up in purple, and after weaving a crown of thorns, they put it on Him...20 And after they had mocked Him, they took the purple off Him, and put His garments on Him. And they led Him out to crucify Him. Luke 12:22 And He said to His disciples, "For this reason I say to you, do not be anxious for your life, as to what you shall eat; nor for your body, as to what you shall put on. Galatians 3:27 For all of you who were baptized into Christ have clothed yourselves with Christ. (Comment: This putting on refers to salvation, at which time the Spirit replaced our filthy rags of sin with the righteousness of Christ - this is now and forever our new position before God. He sees us in Christ's righteousness - the theologians refer to this as positional truth = past tense salvation = justification). Ephesians 4:24 and put on (not a command - aorist tense) the new self, which in the likeness of God has been created in righteousness and holiness of the truth. (Comment: As discussed in the notes there is debate between excellent commentators, some favoring this putting on as indicative of positional truth and others favoring it as calling for this to be our practice - progressive sanctification or present tense salvation). 1 Thessalonians 5:8 But since we are of the day, let us be sober, having put on (at the time of our new birth = justification = our position = past tense salvation) the breastplate of faith and love, and as a helmet, the hope of salvation. 1 Corinthians 15:53 For this perishable must put on (glorification = future tense salvation) the imperishable, and this mortal must put on immortality. 54 But when this perishable will have put on the imperishable, and this mortal will have put on immortality, then will come about the saying that is written, "Death is swallowed up in victory. What a "wardrobe" God has made available for believers! We're the "best dressed" folks in the world and most of us don't even know it! Full armor of God - genitive of source or origin indicating that God provides the armor. So we need not only Divine armor but that equipment in its completeness and with no part missing or in disrepair. Paul frequently pictures the Christian as a soldier in his writings - see Ro 6:13, 23, Ro 13:12, 2Cor 10:4, 1Thes 5:8, 1Ti 1:18, 1Ti 6:12, 2Ti 2:3-4, 4:7). It is not surprising that Paul would draw the analogy of the Christian life with that of a soldier, for it was to a soldier that he was chained while in prison. Full armor (3833) (panoplia from pás = all, every + hoplon = weapon, originally any tool or implement for preparing a thing, became used in the plural for weapons of warfare) is literally wholly armed and refers to the complete set of instruments used in offensive and defensive war. The literal meaning referred to the full preparation of a foot soldier for offense and defense - the complete suit of armor. Certainly Paul could claim knowledge of the Roman soldier’s armor, being chained to one for some three years. God has supplied the complete armor, but He expects the Christian to put it on. We need the divine equipment in its completeness, without the lack of any single part. God has not sent us out into battle without everything we need at our disposal. However, there is no armor for the back -- we are expected to face our foe! This Greek word gives us our English word, panoply, which refers to a full suit of armor; ceremonial attire; something forming a protective covering; a magnificent or impressive array; display of all appropriate appurtenances. Luke 11:22 but when someone stronger than he attacks him and overpowers him, he takes away from him all his armor on which he had relied, and distributes his plunder. How does the believer put on the full armor of God? One of the most important ways is to hide God's Word in our heart (Ps 119:9-11) as if our very life depended upon it because our spiritual vitality does. Toward the close of World War II, Allied forces were mopping up against remaining Nazi resistance. One particular unit was assigned a crucial mission in Berlin. Each soldier had to memorize a map detailing all of Berlin's important military sites -- and they had to do it in a single night! In just a few hours, each soldier in the unit had committed the map to memory. The mission was a success. Several years later, the Army conducted an experiment to see if that original feat could be duplicated. They offered a similar unit an extra week's furlough--an attractive incentive--if they could carry out a comparable mission without a hitch. But the second unit could not match the success of the first. What made the difference? The lives of the men were not at stake. Surviving in battle was a greater motivation than a week's vacation. Christians are engaged in spiritual warfare. Our road map, our plan of strategy against Satan's military strongholds, is the Bible. The more we read it, the more of it we memorize, and the more thoroughly we know it, the more effective we will be for God. We must approach God's Word as if our lives depended on it--because they do. That's real motivation! If your life depended on knowing the Bible, how long would you last? So that (4314) (pros) means "towards" and in this context introduces a purpose clause. Expositor's Greek NT adds that "the general sense of direction (is) conveyed by the flexible preposition pros... In this short sentence it expresses mental direction, aim or object, and local direction, against." Will be able (1410) (dunamai - see also related word dunamis = gives us English words like dynamic, dynamite, dynamo, etc) means to have power by virtue of inherent ability and resources. In this context this enablement is supernatural power. How else could we ever stand firm against our Adversary (or his demonic host of henchmen)? Simply put - we could not stand without the Spirit's supernatural enablement. Thank you Father for providing for us everything necessary for life and godliness (according to a true knowledge of Christ - 2Pe 1:3-note) and victory over our mortal foes, the the world, the flesh and the devil. Amen. Paul uses the present tense and thus is saying that we are to continually be provided with this Divine enablement. No power outages or shorted circuits (because of willful sin for example) are allowed if we are to win each battle. Dunamis is God's omnipotent, omnipresent, inherent (miracle working) ability to enable us to accomplish what He commands us to do -- in this case to stand firm when the battle is raging all around us! Note the passive voice (You may see in some of the online sources that include tense, voice and mood that the Textus Receptus says "middle or passive deponent" but clearly the context favors the passive voice) indicates that this enabling is an internal enablement provided by an outside source, the Spirit of God (see notes on "surpassing greatness of His power" - Eph 1:19-note; "strengthened with power through His Spirit in the inner man" - Eph 3:16-note; "Him Who is able to do...according to the power that works within us" -Eph 3:20-note ; "be filled filled [controlled] with the Spirit"-Eph 5:16-note). What does that mean practically? It simply means that we have to be willing to let God enable us (See Php 2:13-note for how we even become "willing"!) We have to surrender. We have to yield our "rights." We have to be willing to let Him have His way rather than us having our way. We have to be willing to allow His Spirit to strengthen and control us at every moment during the battle. And thus strengthened in our inner man, we can then make the choice to take a stand, to hold firmly to our position, to resist the temptation to doubt, to fear, to gratify, etc, etc. We are more than conquerors through Christ Who loved us on Calvary and will love us eternally (Ro 8:37KJV). With such assurance and empowerment we can stand firm against every assault to the praise of the glory of His grace which He so richly lavishes upon us. Notice that Paul uses dunamai three times in this short treatise on spiritual warfare indicating our need for enablement and our need to be willing to yield and receive power from the Spirit! (See note on Eph 6:16- note, cp Eph 6:13-note) In other words, attitudes such as self confidence, self sufficiency and self assurance, etc, have to be cast off like filthy garments of unrighteousness if we are to receive the necessary divine empowerment God graciously makes available. The tactics of intimidation and insinuation alternate in Satan’s plan of campaign. He plays both the bully and the beguiler. Force and fraud form his chief offensive against the camp of the saints. The word "stand" there has the idea not of a casual standing but of a digging in. The sandals of the Roman soldiers had spikes on them so they could dig in and hold their ground and not be knocked off course. 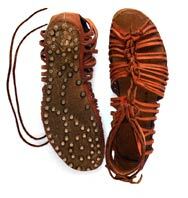 (Click picture to enlarge figure of the spiked soldier shoes called "caligae") That is the idea of standing. It is not just a casual standing up. It has the idea of standing firm and holding the ground that you are on, not being knocked off course. You need to understand that Satan is in this world and wants to come in your face and put deceit in your mind. If you are not being strengthened in the inner man, your mind being affected by truth, letting the Lord Jesus Christ motivate you and live His life through you, you are a "dead duck". If you are not in the Word of God, you are not consistently seeking to let Him control your life...If you are not putting the Word in your mind, letting truth affect your life, then you have missed the whole point of what this conflict is over. It is not power against power. God can sneeze and put him down. It is the battle of truth. That is why it is so important for us to understand that we need to be strengthened in the inner man at all times because that affects the way we think and that affects the way we live. Stand firm (2476) (histemi) means to stand. In context it conveys the idea of digging in (the Roman sandals had spikes for this purpose). It was a military term for holding one's position. Hold your ground. Don't give an inch of territory to the enemy. That is the picture. From a practical standpoint one stands firm by living the obedient, Scripture–dominated, Spirit–empowered life - the Spirit in such a state is not quenched or grieved and strengthens the obedient believer to stand firm. The greatest weapon we have in warfare is not what we say to the devil but how we live the ''Christ life''. Obey, surrender, submit for this is your greatest weapon. It's not binding but it's bowing, saying ''yes'' to Jesus and committing to do His Word...at the moment He says it...then at that moment you become a fortress against the devil. Using the metaphor of a battle, in the military sense to stand firm meant to hold a watch post or to stand and hold a critical position on a battlefield while under attack! The intent of Paul's exhortation is not unlike that of our Lord to the embattled church at Thyatira, whom He commanded, “hold fast until I come” (Rev 2:25). The believer needs to be strengthened in the inner man, letting our mind be affected by the truth, and letting the Spirit of Christ motivate us (Ezekiel 36:27, see note Philippians 2:12) and live His life through you. Stand firm by being in His word, obeying His word, repenting quickly and returning to your first Love. If you are disobedient you are deceived and a deceived person doesn't even know it! Furthermore when you are deceived you are primed for defeat! That is how good the Deceiver is. Remember his territory is the darkness, this present world system, and even though believers have been transferred out of darkness and into God's marvelous light, we can still choose to place ourselves under his domain by willing disobedience. Schemes of the devil - Here we encounter the commander in chief of the invisible army arrayed against us. He is our sworn, mortal enemy. This is not a video game or a fairy tale but a very real war with a very real, deceptive foe. Against (4314) (pros) expresses direction - toward, on the side of, in the direction of. It can serve as a marker of closeness of relation or proximity. Pros is most commonly translated...against (21), before (10), toward (9). The picture is that of the believer facing these schemes. Comment: Here schemes is not methodeia but noema [from nous = mind] and refers to the content of thinking and reasoning. Samuel Rutherford reminds us that "Satan is only God’s master fencer to teach us to use our weapons." Schemes (3180) (methodeia from methodeuo = to work by method in turn from meta = with, after + hodos = a way) refers to an orderly, logical, effective arrangement, usually in steps followed to achieve an end. It describes deliberate planning or a systematic approach and can have a positive or negative connotation. The negative meaning of methodeia implies the use of clever methods or strategies to attain the desired end. The Scripture always uses methodeia with a negative connotation. Methodeia has reference to planned, subtle, systematized error. Error organizes. It has its systems and its logic. Be alert! Be mature! Satan’s scheming, crafty actions and artful designs have ‘method’ and purpose, for his aim is to mislead the immature who are not grounded on apostolic doctrine. Behind the evil men and women who seek to expound false teaching, there is also a supernatural evil power who seeks to deceive unwary saints with his "devilish" cunning. Think about this simple definition in the context of spiritual warfare. Satan is orderly and logical in his steps employed against you to achieve his nefarious purposes. This realization should prompt each of us to be even more appreciative of the fact that we cannot stand against our invisible enemy in our own intelligence, our own strength or our own human "methods" or "schemes". We must put on the full armor that God supplies in Christ. As alluded to above, the negative connotation of methodeia implies the use of cleverness, craftiness, cunning and deception. The "deceiver" uses specific, subtle, stealthy plans to target each individual, his goal being to defeat, discourage and dishearten. Stated another way, Satan's attacks are "tailor made" ("the schemes"), carefully and methodically selected to attack each person's specific weaknesses and vulnerabilities. His wiles and methods are usually attractive, always deceptive, and often ensnaring. Stay sober and alert! He will attack you sometimes by force and sometimes by fraud. By might or by sleight he will seek to overcome you, and no unarmed man can stand against him. Never go out without all your armor on, for you can never tell where you may meet the devil. He is not omnipresent, but nobody can tell where he is not, for he and his troops of devils appear to be found everywhere on this earth. Satan tempts after some discoveries of God’s love. As a pirate sets on a ship that is richly laden, so when a soul hath been laden with spiritual comforts the devil will be shooting at him, to rob him of all. The devil envies to see a soul feasted with spiritual joy. If you could sneak into Satan’s office, wherever that might be (he’s not in hell yet), and take a peek into his files, you might be surprised to find a file folder with your name on it. I’m not exaggerating. He keeps a file on you, and inside that file are all the strategies he’s tried on you—the ones that have worked and the ones that have failed. He doesn’t waste his time with the ones that don’t work anymore. Instead, he uses variations on the strategies that have caused you to stumble in the past. As long as they keep working, he keeps using them. Somewhere in that file cabinet there’s a file labeled: Jeremiah, David. In this file, I wouldn’t be surprised at all if there was a notation that reads something like this: Subject may be prone to discouragement, especially if he becomes overly weary. This has worked several times before and seems a promising method of attack. Suggestion: Make sure he stays very busy, overcommitted, and physically tired. At all costs, keep him from extended times of Bible reading and prayer. So what is Satan’s strategy for me? He looks for ways to discourage me, and if possible, cause me some depression. He will use whatever people, means, or circumstances it takes to achieve his goal. Don’t kid yourself, he knows very well where your vulnerabilities lie. It’s all in his file. You’ve heard, perhaps, that God loves you and has a wonderful plan for your life. That’s very good news, but it is also true that Satan hates you and has a plan and strategy to destroy your walk with Jesus Christ. Methodeia is translated with a number of words as shown in the list below with each word followed by a definition. As you read through this list think about how each describes your mortal foe, the devil. Craftiness - adept in the use of subtlety and cunning. No place in Scripture reveals Satan’s schemes better than Genesis 3, which records Satan’s initial contact with man. Cunning - characterized by wiliness and trickery. It describes the faculty of executing well what one has devised. Scheming - given to making plots; shrewdly devious and intriguing. Synonyms include artful, calculating, conniving, cunning, deceitful, designing, duplicitous, foxy, Machiavellian, slippery, sly, tricky, underhand, wily. Strategies - careful plans or methods. Strategy can also refer to the art or science of the planning and conduct of a war. The Columbia Encyclopedia notes that "strategy and tactics, in warfare are related terms referring, respectively, to large-scale and small-scale planning to achieve military success. Strategy may be defined as the general scheme of the conduct of a war, tactics as the planning of means to achieve strategic objectives. Synonyms for strategy include: blueprint, design, game plan, project, scheme. Stratagems - an artifice or trick in war for deceiving and outwitting the enemy. A cleverly contrived trick or scheme for gaining an end. Stratagem implies a ruse used to entrap, outwit, circumvent, or surprise an opponent or enemy. Tactics - The derivation of the word tactic is very interesting and gives us some insight into the meaning of the devil's methods. The word "tactics" is from the Greek word taktikos which means "of order, of tactics, fit for arranging" and which in turn is derived from "tassein" which means to arrange or place in battle formation. Tactics is defined then as the science and art of disposing and maneuvering forces in combat. It refers to the art or skill of employing available means to accomplish an end. In short, the tactics of the devil are calculated plans specifically designed to bring the downfall of God’s people and His kingdom. Trickery - the practice of crafty underhanded ingenuity to deceive or cheat. It implies ingenious acts intended to dupe or cheat. Wiles - tricks or strategy carried out with the intent to entice, ensnare or deceive. Wiles suggests an attempt to entrap or deceive with false allurements. In short they are attractive! The KJV has a picturesque rendering of Ephesians 4:14 stating that "they lie in wait (methodeia) to deceive." Methodeia was used to describe a wild animal who cunningly stalked and unexpectedly pounced on its prey, a vivid depiction of the Adversary's "methods" against believers. Satan’s schemes are propagated through the evil world system over which he rules, and are carried out by his demon hosts. “Wiles” is all-inclusive, encompassing every sin, immoral practice, false theology, false religion, and worldly enticement. Methodeia is a Greek word that denotes a path or roadway that is traveled over. This is because the devil continuously attempts to secure a foothold so that he may begin construction of a roadway to your mind." Marvin Vincent adds that "methodeia means a deliberate planning or system." By far, the majority of attacks of the devil against Christians are not direct but indirect. That is why they are called the "schemes" of the devil. Schemes suggest deviousness or acting in a way that is subtle, secretive, and treacherous. Jonathan Edwards wrote that "the best protection one can have from the devil and his schemes is a humble heart." The Open Bible defines our Adversary's "schemes" as "superhuman craftiness, capable of drawing careless Christians into sin." Seldom does Satan ever attack openly with an overt frontal assault (and by the way most of us will probably never be attacked by Satan himself as he is a finite not omnipresent being. But he does command a host of fallen angels who share his evil design for mankind). In contrast, Satan's Schemes are nearly always unseen, shrewd, and perfectly tailored to ensnare his victim like a fowler camouflaging his net to trap a bird ("methodical"). "Schemes, wiles and methods" speak of the trickery and subterfuge by which evil and temptation present themselves in our lives. Evil rarely looks evil until it accomplishes its goal. It gains entrance by appearing attractive, desirable, and perfectly legitimate. But to reiterate it is a baited and camouflaged trap. As Paul puts it in 2 Corinthians 11:14, Satan masquerades as an angel of light. A SUMMARY OF THE "METHODEIA"
Job 1:6-11 Now there was a day when the sons of God came to present themselves before the LORD, and Satan also came among them. 7 And the LORD said to Satan, "From where do you come?" Then Satan answered the LORD and said, "From roaming about on the earth and walking around on it." 8 And the LORD said to Satan, "Have you considered My servant Job? For there is no one like him on the earth, a blameless and upright man, fearing God and turning away from evil." 9 Then Satan answered the LORD, "Does Job fear God for nothing? 10 "Hast Thou not made a hedge about him and his house and all that he has, on every side? Thou hast blessed the work of his hands, and his possessions have increased in the land.11 "But put forth Thy hand now and touch all that he has; he will surely curse Thee to Thy face." Job 2:1-7 Again there was a day when the sons of God came to present themselves before the LORD, and Satan also came among them to present himself before the LORD. 2 And the LORD said to Satan, "Where have you come from?" Then Satan answered the LORD and said, "From roaming about on the earth, and walking around on it." 3 And the LORD said to Satan, "Have you considered My servant Job? For there is no one like him on the earth, a blameless and upright man fearing God and turning away from evil. And he still holds fast his integrity, although you incited Me against him, to ruin him without cause." 4 And Satan answered the LORD and said, "Skin for skin! Yes, all that a man has he will give for his life. 5 "However, put forth Thy hand, now, and touch his bone and his flesh; he will curse Thee to Thy face." 6 So the LORD said to Satan, "Behold, he is in your power, only spare his life." 7 Then Satan went out from the presence of the LORD, and smote Job with sore boils from the sole of his foot to the crown of his head. Zechariah 3:1-2 Then he showed me Joshua the high priest standing before the Angel of the LORD, and Satan standing at his right hand to accuse (Hebrew = satan!) him. 2 And the LORD said to Satan, "The LORD rebuke you, Satan! Indeed, the LORD who has chosen Jerusalem rebuke you! Is this not a brand plucked from the fire?" Job 1:12-19 Then the LORD said to Satan, "Behold, all that he has is in your power, only do not put forth your hand on him." So Satan departed from the presence of the LORD. 13 Now it happened on the day when his sons and his daughters were eating and drinking wine in their oldest brother's house, 14 that a messenger came to Job and said, "The oxen were plowing and the donkeys feeding beside them, 15 and the Sabeans attacked and took them. They also slew the servants with the edge of the sword, and I alone have escaped to tell you." 16 While he was still speaking, another also came and said, "The fire of God fell from heaven and burned up the sheep and the servants and consumed them, and I alone have escaped to tell you." 17 While he was still speaking, another also came and said, "The Chaldeans formed three bands and made a raid on the camels and took them and slew the servants with the edge of the sword; and I alone have escaped to tell you." 18 While he was still speaking, another also came and said, "Your sons and your daughters were eating and drinking wine in their oldest brother's house, 19 and behold, a great wind came from across the wilderness and struck the four corners of the house, and it fell on the young people and they died; and I alone have escaped to tell you." Job 2:6-7 So the LORD said to Satan, "Behold, he is in your power, only spare his life. "7 Then Satan went out from the presence of the LORD, and smote Job with sore boils from the sole of his foot to the crown of his head. Luke 13:16 "And this woman, a daughter of Abraham as she is, whom Satan has bound for eighteen long years, should she not have been released from this bond on the Sabbath day?" Acts 10:38 "You know of Jesus of Nazareth, how God anointed Him with the Holy Spirit and with power, and how He went about doing good, and healing all who were oppressed (katadunasteuo = to tyrannize, rule over as a potentate, oppress harshly, exercise dominion against) by the devil; for God was with Him. Ephesians 6:16; in addition to all, taking up the shield of faith with which you will be able to extinguish all the flaming missiles of the evil one. Acts 13:10 (Saul known as Paul filled with the Holy Spirit spoke to Elymas the magician who was opposing the apostles) and said, "You who are full of all deceit (dolos = deliberate attempt to mislead other people by telling lies, duplicity, deliberate dishonesty, deceitful cunning) and fraud (recklessness, malignity, mischief, intrigue, unscrupulousness), you son of the devil, (in Acts 13:6 he is called "Bar-Jesus" = son of Jesus or son of Joshua! cf 2Cor 11:13-15 below) you enemy of all righteousness, will you not cease to make crooked the straight ways of the Lord? 2Cor 4:3-4 And even if our gospel is veiled (kalupto = covered over and hence not visible), it is veiled to those who are perishing (apollumi = pertains to destruction but not annihilation, to that which is ruined and is no longer usable for its intended purpose), 4 in whose case the god of this world (aion) (cf 1John 5:19) has blinded (tuphloo - cf use in 1John 2:11) the minds of the unbelieving (note that this speaks of their rejection of the light of the gospel which leaves only one alternative, the darkness of unbelief! ), that they might not see the light of the gospel of the glory of Christ, Who is the image of God. 2Cor 11:13-15 For such men (those who were boasting that their work was like Paul's and the real apostles) are false apostles (pseudapostolos), deceitful (dolios - guile filled, from dolos = one who deliberately attempt to mislead by telling lies with desire to gain advantage or preserve position) workers, disguising (metaschematizo from metá = change of place or condition + schematízo = change outward form without a change in the internal character as in metamorphoo = transfigure, transform, the outward here being truly representative of the inward nature) themselves as apostles of Christ. 14 And no wonder, for even Satan disguises himself as an angel of light. 15 Therefore it is not surprising if his servants also disguise themselves as servants of righteousness; whose end shall be according to their deeds. 2Thess 2:8-10 And then that lawless one (Anti-Christ, man of lawlessness, son of destruction in 2Thess 2:3-4, the "little horn" of Da 7) will be revealed (apokalupto - he will be caused to be fully known, this "revelation" corresponding to the midpoint [3.5 years, time, times, half a time, 42 months, 1260 days] of Daniel's Seventieth Week) whom the Lord will slay with the breath of His mouth (cf Rev 19:15, 20) and bring to an end by the appearance (epiphaneia - literally His "shining forth" or upon with the idea of sudden and unexpected!) of His coming (parousia - the Second Coming of Christ); 9 that is, the one whose coming is in accord with the activity (energeia - operative power) of Satan, with all power and signs and false (pseudos = lying) wonders, 10 and with all the deception (apate = that which gives a false impression, whether by appearance, statement or influence; causes one to have misleading or erroneous views concerning the Truth) of wickedness for those who perish, because they did not receive the love of the truth so as to be saved. 11 And for this reason God will send upon them a deluding influence (this is a Divine judicial decree, a reaping of their sowing, a consequence of their refusal to readily and deliberately make the choice to accept the Truth by which they could have been delivered and born again) so that they might believe what is false. 1Thessalonians 2:18 For we wanted to come to you-- I, Paul, more than once-- and yet Satan thwarted (egkopto from en = in + kopto = cut down, strike. To hinder, impede, detain. In classic Greek a military metaphor = to cut in on, throw obstacles in the way of or cut up the road so that normal movement is impossible!) us. John 13:2,26-27, 30 And during supper, the devil having already put into the heart of Judas Iscariot, the son of Simon, to betray Him... 26 Jesus therefore answered, "That is the one for whom I shall dip the morsel and give it to him." So when He had dipped the morsel, He took and gave it to Judas, the son of Simon Iscariot. 27 And after the morsel, Satan then entered into him. Jesus therefore said to him, "What you do, do quickly. "...30 And so after receiving the morsel he went out immediately; and it was night (an appropriate time for Judas who was now fully controlled by darkness, cf Luke 22:53 "While I was with you daily in the temple, you did not lay hands on Me; but this hour and the power [exousia] of darkness are yours."). Acts 5:3, 9 But Peter said, "Ananias, why has Satan filled your heart to lie to the Holy Spirit, and to keep back some of the price of the land?...9 Then Peter said to her, "Why is it that you have agreed together to put the Spirit of the Lord to the test? Behold, the feet of those who have buried your husband are at the door, and they shall carry you out as well." 2Cor 2:11 (repent of an unforgiving spirit) in order that no advantage be taken of us by Satan; for we are not ignorant of his schemes. (Comment: When we sin and fail to repent we give the devil an opportunity. In this verse the sin is unforgiveness and it allows Satan to take advantage, to exploit, to cheat or to defraud. We need to get out of the darkness and walk in the light, where Satan cannot gain an advantage. If the church family—or any person in the family—carries an unforgiving spirit, then Satan will use that attitude as a beachhead for new assaults against the church. As someone has well said an unforgiving spirit is the devil’s playground, and before long it becomes the Christian’s battleground. If somebody hurts us, either deliberately or unintentionally, and we do not forgive them, then the potential is for us to develop bitterness, which hardens the heart. We should be tenderhearted and kind, but instead we are hardhearted and bitter. Actually, we are not hurting the person who hurt us but are only hurting ourselves. Bitterness in the heart makes us treat others the way Satan treats them, when we should treat others the way God has treated us. In His gracious kindness, God has forgiven us, and we should forgive others. God Himself is infinitely kind, tender–hearted, and forgiving, and we show those virtues by imitating their Source. We do not forgive for our sake or even for their sake, but for Jesus’ sake. Learning how to forgive is one of the secrets of a happy Christian life and allows one to stand firm against the schemes of the devil. 1Timothy 3:7 And he must have a good reputation with those outside the church, so that he may not fall into reproach and the snare (pagis - a trap which is fixed or fastened by a noose or notch and which can fall unexpectedly or suddenly so that wild animals and birds are caught by surprise) of the devil. Mt 13:19 "When anyone hears the word of the kingdom, and does not understand it, the evil one comes and snatches away what has been sown in his heart. This is the one on whom seed was sown beside the road. Luke 8:12 "And those beside the road are those who have heard; then the devil comes and takes away the word from their heart, so that they may not believe and be saved. Mark 1:12-13 And immediately the Spirit impelled Him to go out into the wilderness. 13 And He was in the wilderness forty days being tempted (peirazo) by Satan; and He was with the wild beasts, and the angels were ministering to Him. Luke 4:1-13 And Jesus, full of the Holy Spirit, returned from the Jordan and was led about by the Spirit in the wilderness 2 for forty days, being tempted (peirazo) by the devil. And He ate nothing during those days; and when they had ended, He became hungry. 3 And the devil said to Him, "If You are the Son of God, tell this stone to become bread. "4 And Jesus answered him, "It is written, 'MAN SHALL NOT LIVE ON BREAD ALONE.'" 5 And he led Him up and showed Him all the kingdoms of the world in a moment of time. 6 And the devil said to Him, "I will give You all this domain (exousia) and its glory; for it has been handed over to me, and I give it to whomever I wish (Jesus did not correct Satan - the world system indeed had been given to him as John wrote "We know that we are of God, and the whole world lies [asleep like a baby in a cradle!] in the power of the evil one" 1John 5:19). 7 "Therefore if You worship before me, it shall all be Yours." 8 And Jesus answered and said to him, "It is written, 'YOU SHALL WORSHIP THE LORD YOUR GOD AND SERVE HIM ONLY.'" 9 And he led Him to Jerusalem and had Him stand on the pinnacle of the temple, and said to Him, "If You are the Son of God, throw Yourself down from here; 10 for it is written, 'HE WILL GIVE HIS ANGELS CHARGE CONCERNING YOU TO GUARD YOU,' 11 and, 'ON their HANDS THEY WILL BEAR YOU UP, LEST YOU STRIKE YOUR FOOT AGAINST A STONE.'" (Here the devil misquotes Scripture to his advantage - this promise applies only to those whose ways are in God's will and Satan left that critical detail out of the verse when he quoted Ps 92:11-12) 12 And Jesus answered and said to him, "It is said, 'YOU SHALL NOT PUT THE LORD YOUR GOD TO THE TEST.'" 13 And when the devil had finished every temptation, he departed from Him until an opportune time (see study of kairos). 1Thess 3:5 For this reason (knowing they were going to suffer affliction which might have made them vulnerable to the schemes of the devil), when I could endure it no longer, I also sent to find out about your faith, for fear that the tempter (peirazo) might have tempted you, and our labor should be in vain (empty, fruitless, without success). This list (which is not exhaustive) of the "wiles of the devil" should thoroughly convince each of us of our need to be totally dependent on the full of armor of God and His Spirit's strengthening of our inner man, causing us not to hesitate for even a moment to put on the whole armor! What are you waiting for dear Christian friend? Are any of the "pieces" missing or in disrepair. Then return and confess and repent and go forth into battle as more than a conqueror through Him Who loved us. For another because it is new. But who dogs the steps of the toiling saint? Who spreads the net for his feet? Where the Savior sows His wheat? Who carries the business on? A. T. Robertson warns that the devil "is a crafty foe and knows the weak spots in the Christian’s armor." Expositor's Bible Commentary writes that..
A. Makes us think money is more important than living sincerely before God. B. Defames God’s character by accusing him of impure motives. C. Opposes the necessity of Christ’s death for our salvation. D. Tries to cripple spiritual leaders. E. Prevents believers from meeting together in fellowship. F. Prevents non-Christians from understanding and believing the gospel. "For more than a week I was close to the gates of death and hell." It is therefore no surprise that Luther's great hymn A Mighty Fortress Is Our God has such great stanzas on "spiritual warfare. “The content of his depressions was always the same, the loss of faith that God is good and that He is good to me." You dare not trust your own. Satan is a dangerous enemy. He is a serpent who can bite us when we least expect it. He is a destroyer (Rev 12:11; Abaddon and Apollyon both mean “destruction”) and an accuser (Zech. 3:1, 2, 3, 4, 5; Rev. 12:9, 10, 11). He has great power and intelligence, and a host of demons who assist him in his attacks against God’s people (Eph 6:10ff). He is a formidable enemy; we must never joke about him, ignore him, or underestimate his ability. We must “be sober” and have our minds under control when it comes to our conflict with Satan. The works of the devil are defined as "schemes" (Ephesians 6:11), "devices" (KJV) (2Cor 2:11), "snares" (2Ti 2:26-note). Our adversary beguiles, seduces, opposes, resists, deceives, sows tares, hinders, buffets, tempts, persecutes, blasphemes. Our adversary is personal, aggressive, intelligent, cunning and destructive, and is to be reckoned with seriously, vigilantly and intelligently. Be careful to avoid one of two extremes in regard to the devil. First, do not think that Satan causes everything and is everywhere. Satan is a created being and a controlled being (cf. see especially Job 1-2; Zech. 3:1, 2, 3, 4, 5) and is neither omnipresent nor omniscient. The other extreme is justly as dangerous and that is to think that there is no such being as the devil, but that he is imaginary or myth. He is very real and very wily believers need to be very wary (not frightened). As stated elsewhere in the notes the spiritual struggle believers face with the devil and his demonic henchmen is not a power struggle as much as it is a truth struggle and the primary battlefield is therefore our minds. In Ephesians 2:1, 2:2 (see notes) we are introduced to him. Comment: Satan occupies a twofold in the earth and in the air; ruling over both evil men and evil spirits. Christ never acknowledged Satan as king, but three times he calls him "the prince of this world," thereby acknowledging his governmental authority. Ephesians teaches that he is the ruling spirit over "the sons of disobedience," which includes all unregenerate mankind. The devil was once an angel in heaven, the most beautiful angel in heaven. He led a rebellion against God and, as a result, was cast into the lower heavens. He walks on this earth, but he still has access into heaven to accuse the brethren both day and night. "the serpent was more crafty than any beast of the field which the LORD God had made. And he said to the woman, "Indeed, has God said, 'You shall not eat from any tree of the garden'?" As a result of the sin of Adam, the depravity of man, the authority of this earth, its inhabitants and its lower atmosphere became Satan’s legally in the just system of God. When man sinned, it was like the world was turned over to the authority (exousia = now Satan had the right and might) of darkness, legally, because man chose to disobey his God. Death, the result of the curse of sin, was his weapon. His kingdom is a kingdom of darkness and deceit. Every person is born into his kingdom. He didn’t say He seated Him above, he said He seated Him "far above". Let me explain to you what that means. If you could take the power of Satan and put it on a scale next to the power of God, his doesn’t even show up. God’s is far above all principalities and powers. I want you to know that warfare is not a struggle against power. It is a struggle to maintain truth. We will see that as we walk through this. Satan is no equal to God. He is a creation. God is the Creator! Well, the believer needs to be aware that Satan is around. We are told that by Peter in his epistle. We need to be aware of the demonic. We need to be aware of darkness. We need to be aware that it has infected a world system and is in our face daily. We need to be aware of that, however, our focus is not to be on that. Our focus is to be on the resurrected, ascended, glorified Lord Jesus Christ and on His resurrection power in each individual life. Our FOCUS is to be on the resurrected, ascended, glorified Lord Jesus Christ and on His resurrection power in each individual life. That is our focus. We do not focus on darkness. We focus on light. The Prince and the power of light is the Lord Jesus Himself. Diabolos is the noun form of the verb diaballo which describes not only those who bring a false charge against one, but also those who disseminate the truth concerning a man, and do so maliciously, insidiously and with hostility. Diabolos is applied some 34 times to Satan, the god of this world, and in each case has the definite article in the Greek ("the" = defining a specific entity) and is never in the plural (the three uses below in the pastoral epistles are all plural) as when applied to men who, by opposing the cause of God, may be said to act the part of the devil or to side with him. Note that this discussion of diabolos is intended to focus primarily on the meaning of the Greek word and not the more general Biblical teaching on the devil. For more all inclusive articles on "the Devil" click one of the following resources: Torrey's Topical provides an excellent Scriptural summary of "The Devil" (see also Torrey's topic on the various Names of the Devil) ; Holman's Bible Dictionary article has a well done summary on "Devil"; Nave's Topical Analysis of Satan; in depth article on "Satan" in International Std Bible Encyclopedia. Are you safe and protected from the devil's accusations "in Christ Jesus" dear reader? If not, cry out this very moment to the Most High God for Him to give you His grace that you might this moment experience eternal security in Christ through your exercising of personal faith in Christ's life, death, burial, resurrection and sure, soon return. God is faithful. "If the devil can't mislead people that way, he would have them think of him as a horrible, monstrous-looking creature with a forked tail, dressed in a fiery red suit, and with horns protruding from his head. If the devil can get folks to think of him like that, then when he comes as an 'angel of light', he will not be recognized, and so find it easier to beguile his unsuspecting victims." The respondents also noted that temptations were more potent when they had neglected their time with God (81 percent) and when they were physically tired (57 percent). Resisting temptation was accomplished by prayer (84 percent), avoiding compromising situations (76 percent), Bible study (66 percent), and being accountable to someone else (52 percent). Where he cannot destroy, there is no doubt that Satan’s object is to worry. He does not like to see God’s people happy. Martin Luther used to say, “Let us sing psalms and spite the devil,” and I have no doubt Martin Luther was pretty nearly right; for that lover of discord hates harmonious, joyous praise. As the worker in metals knows that one metal is to be worked at such a heat, and another at a different temperature; as those who have to deal with chemicals know that at a certain heat one fluid will boil, while another reaches the boiling-point much earlier, so Satan knows exactly the temperature at which to work us to his purpose. Small pots boil directly when they are put on the fire, and so little men of quick temper are soon in a passion; larger vessels require more time and coal before they will boil, but when they do boil, it is a boil indeed, not soon forgotten or abated. The enemy, like a fisherman, watches his fish, adapts his bait to his prey; and knows in what seasons and times the fish are most likely to bite. "I am looking for the spiritually naive. I'm patrolling the earth for simple souls who think that I am not real." Dost ask who that might be? His rage we can endure. One little word will fail him. The ancient sport of falconry used trained hawks or falcons in the pursuit of wild game. When the "educated predator" was allowed to fly, however, it often rose too high for human eyes to see. So a hunter often carried a small caged bird called a shrike. By watching the antics of the little bird, the man could always tell where his hawk was, for the shrike instinctively feared the predator and cocked its head to keep it in view. Christians desperately need an alert perception similar to that of the shrike to detect their spiritual enemy. Our adversary, Satan, "walks about like a roaring lion, seeking whom he may devour" (1 Peter 5:8). Our responsibility, according to the apostle Peter, is to be sober and vigilant. In other words, we’re to be always on the alert. In Andrew Lloyd Webber’s musical The Phantom of the Opera, a young chorus girl named Christine Daae receives voice training from a mysterious musician she calls the “Angel of Music.” Christine believes this is the angel her dying father had promised to send to complete her musical training. As the plot thickens, we find that her mysterious mentor is really a demented man who wants to carry her away into a bizarre underworld beneath the opera house. What the girl thinks is a supernatural agent sent by her beloved father is really a madman who wants to possess her for his own ends. The “Angel of Music” is evil masquerading as good. God’s armor is tailor-made for us, but we must put it on. As a young man in the late 1600s, Edward Teach joined the crew of a British ship that was headed to the Caribbean. Much later in his nautical career, he managed to capture a merchant vessel and turn it into a 40-gun warship. Teach soon became known as Blackbeard—the most feared pirate in the hemisphere. Blackbeard had some success as a pirate, but his “career” abruptly ended when he encountered a contingent of the British Royal Navy. In a desperate battle, he and his fellow pirates were killed, putting an end to their terrorizing exploits. Long ago in the heavenly places, an angel fell into spiritual piracy. Lucifer was a cherub who stood in the radiant glory of God (Ezekiel 28:11, 12, 13, 14, 15). But his own self-love replaced love for his Creator. Desiring to be like the Most High, he led a rebellion and was cast out of heaven (Isaiah 14:12, 13, 14, 15). Today he and his henchmen are doing whatever they can to commandeer the lives of human beings (Luke 8:12; 2Cor 4:4). Nobody is temptation-proof. Even mature Christians have weaknesses in their spiritual armor that make them vulnerable to a wounding attack by the enemy of their souls. Our pride can provide the very opening needed for the sharp thrust of a satanic dart. So can the love of money, a quick temper, a critical tongue, or chronic impatience. What, after all, is temptation? It's any enticement to think, say, or do something contrary to God's holy will. It may be a weak impulse or a powerful urge. It's anything that's against what God approves or desires for us. The ancient Greeks told a story of a warrior named Achilles. His mother had been warned that he would die of a wound, so she dipped him as an infant in the river Styx. That was supposed to make him invincible. But she held him by one heel which the protective waters didn't cover. And it was through that heel that he received his fatal wound. Our greatest weakness may be our failure to ask for God's strength.